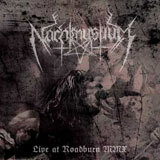 Chicago, Illinois’ progressive black-metallers Nachtmystium are truly one of the most innovative yet heavy bands of this generation, so it comes as no surprise that they pull out all the stops in their extravagant debut live release from the 2010 Roadburn Festival. From humble beginnings as a Satanic black-thrash outfit, Blake Judd and co have risen to widespread critical acclaim with 2008’s landmark ‘Assassins: Black Meddle Part I’ and the 2010 follow-up ‘Addicts: Black Meddle Part II’ spring-boarding them onto the map as a band not afraid to shatter boundaries. This live epic is largely culled from these two records, but with the band roping in Ron van Herpen (Astrosoniq/The Devils Blood) and Teun van der Velden (Astrosoniq) to play lead guitar and synthesizers respectively due to the last minute absence of regular touring guitarist Pat Clancy, this is a truly unique one-off performance. Van der Velden’s play in particular melds superbly with the fearsome shredding and powerhouse drumming of the regular band, to provide a space-rock-like swirl of mysticism to the up-front metallic might. It must be noted that both van der Velden and van Herpen only met the band they accompany here so well on the day of the festival and had just a 3-hour practise jam before being thrust onto the main stage, hence making their contributions even more remarkable. Kicking off with the brutal pounding of ‘Your True Enemy’ from the Assassins record, it’s the typical story for the opening track of any live gig – the levels aren’t right. The synths and drums coming thundering through initially, but it takes until the end of the track and van Herpen’s gorgeous solo for the music to really ring true. However, all this is rectified by the time the chiming intro to the disco stomp that is ‘Ghosts of Grace’ rings out across the auditorium and cements Nachtmystium’s poise as a metal group drawing on the influences and rhythms of so many other genres than just blast beats and fury. Judd is clearly ecstatic to be at Roadburn and is quick to let the crowd in on the band’s pride and excitement in between his trademark death-growling ballads. The Americans barrage on determinedly, taking in tracks from the then newly-released Doomsday Derelicts EP with the surging ‘Life of Fire’ and the more traditional proto-metal ‘Hellish Overdose’, segmented by ‘A Seed For Suffering’ and ‘Chosen By No One’ from 2007’s Instinct: Decay record. As the set powers towards its conclusion, Judd also offers a cut from the unreleased Addicts record – the dominating ‘High On Hate’, before launching into the enormo-riffs of ‘One of These Nights’ to preclude mighty closer ‘Assassins’. Throughout, Nachtmystium once again demonstrate that a black metal band does not have to be just that. Doom rock, trance, traditional metal and even elements of pop are at play here and the inclusion of two additional musicians adds a delicious uncertainty to the live frenzy. Yes, this is clearly a band with brutal metallic power at its heart, but with an intelligence and huge elements of improvisation in its top-three inches to clearly distinguish themselves from the USBM pack. Whilst ultimately I’d advise those new to the band to invest in the mesmeric ‘Assassins’ and the genre-bending ‘Addicts’ albums over this, Live At Roadburn is a positive confirmation that there are few bands out there who can match Nachtmystium’s ferocity and finesse.